By now I think everyone knows my love for meatloaf. I have lots of different recipes on the blog here that you can try – Alton Brown, America’s Test Kitchen, Cook’s Country and many others – but I am always on the lookout for new and exciting ways to serve meatloaf. Lately I have been getting a lot of recipes from New York Times Cooking, which is a great site that has thousands of fantastic recipes on from basic to more complex. I came across this great meatloaf recipe on there about a week ago for meatloaf with a wonderful maple glaze on it and it sounded like the perfect fall meatloaf to give a try. I was not disappointed in the results. Chop 1/4 pound of the bacon; saute the chopped bacon in a large skillet set over medium-high heat until the bacon is browned but not crisp, about 8 minutes. Transfer the cooked bacon to paper towels so it can drain. Add the onion and garlic to the skillet. Cover the skillet and cook the vegetables over low heat, stirring occasionally, until the onions have softened, about 10 minutes. Remove the skillet from the heat and set it aside. Heat the oven to 375 degrees. In a medium bowl, whisk together the milk, sour cream or yogurt, eggs, dry mustard, salt, dried thyme, Worcestershire sauce, ground black pepper and the hot pepper sauce until it is blended. In a separate large bowl, combine the ground beef, ground pork and ground veal, the cooked bacon pieces, the cooked onion mixture and the milk mixture. Using your hands, toss the ingredients lightly to mix them together. Add the crushed saltines and the parsley and toss the mixture lightly again until everything is thoroughly combined. Line a rimmed baking sheet with aluminum foil. On the lined baking sheet for the meet into a loaf of about 5 inches by 12 inches. Drape the remaining strips of bacon lengthwise over the loaf to completely cover the loaf. In a small bowl, combine the maple syrup and the Dijon mustard. Paint a thick coating over the bacon on the meatloaf. Bake the meatloaf, uncovered, until a thermometer inserted into the center of the loaf reads 165 degrees, about 1 1/4 to 1 1/2 hours. If you desire, baste the loaf occasionally with the remaining maple syrup mixture. Let the meatloaf rest for about 10 minutes before slicing it and serving it. This meatloaf was delicious. 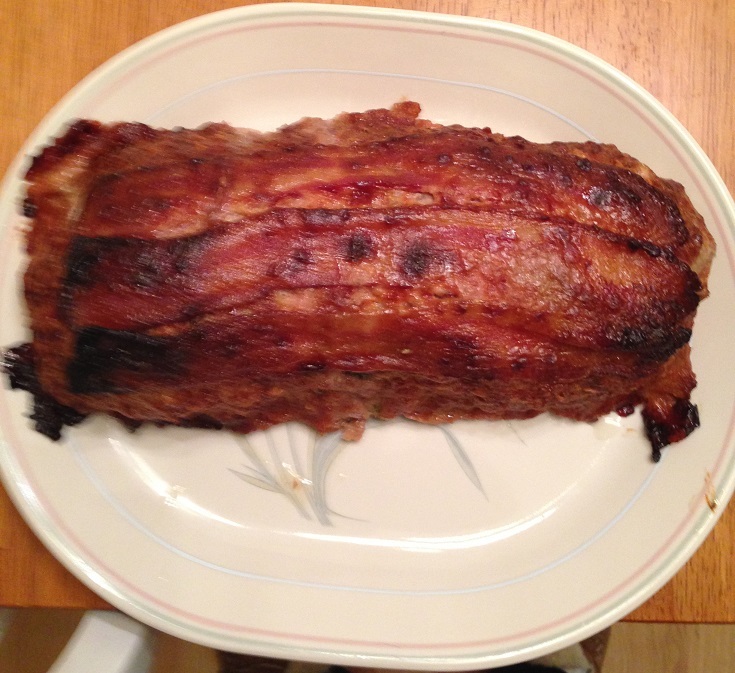 I used meatloaf mix or beef, pork and veal that I get at the store and I didn’t use as much bacon in or on the meatloaf itself as the recipe indicates only because Michelle has some trouble with bacon, but the overall flavors for this meatloaf were fantastic. I loved the crust you get on the top from the maple glaze on the bacon and this meatloaf held together really well and was easy to slice. I think the combination of the saltines, milk and sour cream really helped bind everything, along with the eggs. The flavor in the meatloaf was great too, thanks to the bacon, onions and garlic with just a hint of spice and heat. This was great with the homemade tater tots I made that night, but I think it would be perfect with mashed potatoes or even better with sweet potatoes that have a little brown sugar and maple syrup on them as well. Of course, it was awesome for meatloaf sandwiches the next day as well and I think it would be great for an open-faced meatloaf sandwich with a little gravy. Yum! I will definitely add this one to my meatloaf arsenal. I just ran across your website. You’ve got some fantastic recipes on here! I was looking for Americas Test Kitchen bacon wrapped meatloaf that i had seen Chris and Bidget make on their show. I found it, but they wanted me to renew my membership b4 i could get it. I had a mem ership, wbich i rarely used, so wasnt worth $35 for a meatloaf. I just saw another blog that complains about ATK and Cooks Country shady marketing. I had a subscription for 19.99 a yr. It shy rocketed to $75!!! I like their recipes, but not that much so thank you very much for posting. You’re welcome Patty! I am glad you found a recipe you like. I do try to share recipes as often as I can, though life has prevented me from blogging much recently. I do hope to get back on soon and share some more. Thanks for commenting!